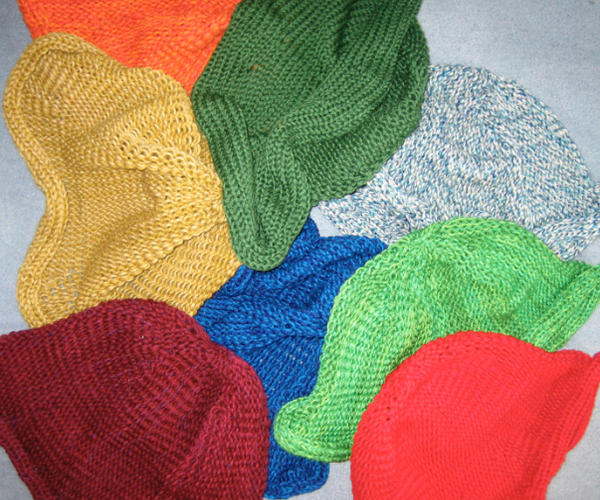 This time of year I am usually producing machine knit felt hats for sale, on my 260 Brother bulky KM. They are knit sideways, and require seaming on their completion. Photos of some steps in process, taken a previous year: There is a lot published on methods to graft open stitches using kitchener. Hand knit magazines both in Britain and here have begun to present joining a variety of pattern stitches with with charts that visually clarify the process. A small portion of such a chart: With bulky knits such as my hats, I like to take open stitches onto circulars and sew them together by hand as shown below, beginning on right, and with the knit side facing me. joining knit ending on waste yarn, purl side facing joining knit ending on waste yarn, knit side facing joining garter stitch ending in waste yarn Diana Sullivan offers youtube videos showing how to join pieces with waste yarn endings with their purl side or knit side facing respectively. 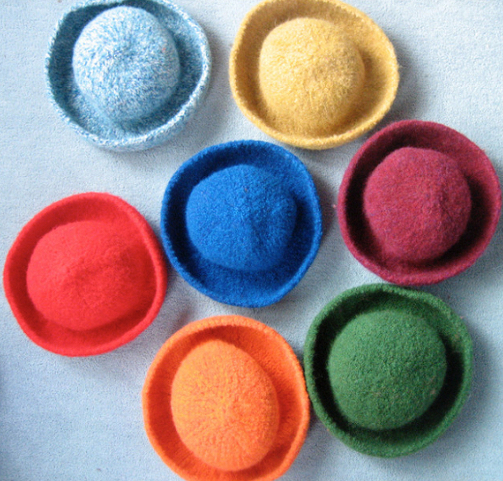 Seam as you knit is an option for joining vertically. 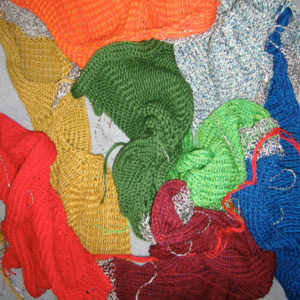 It is a technique that may be used to attach bands, parts of a sweater, or strips of knitting, whether for the sake of additional width, changes in color, or attached with purl side facing the knit side if that is the goal. The piece on the machine is always purl side facing. With each row knit, a “loop” is created on the carriage side, while a “knot” is formed on the opposite side as the row is completed. The process then reverses as the carriage returns to its original position. The technique may be done on either, or even both sides at once. The first piece(s) is (are) completed and taken off the machine. Begin the join to piece with a cast on row or waste yarn. For a test, with COR: pick up the first knot or loop on the completed piece. Hang it on the left end needle/ stitch on the cast on work (opposite the carriage). Knit 2 rows. Go to the next knot or loop on the completed piece, place it on the same left side needle/ stitch. You are hanging on the far needle opposite the carriage every 2 rows. The knit fabric, purl side facing A one eyed tool is inserted from front to back through either a loop or a knot, and hung on the first needle hook / stitch on the right, left, or even both sides of the piece every 2 rows. Joining “loops” generally works well in standard gauge knitting. On the bulky, or where a “tighter” seam line is needed, join “knots”. 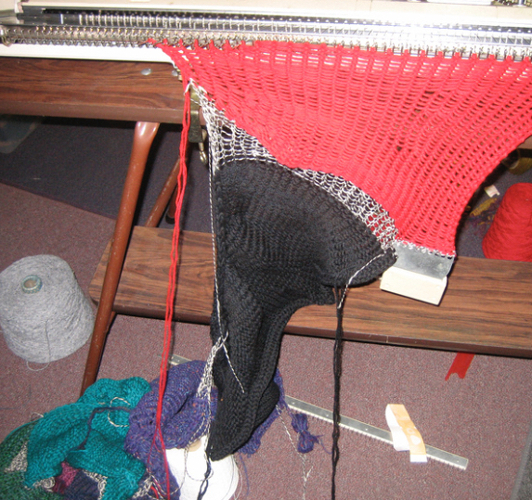 The same method may be used to join the side edge of any piece of knit to any portion or location on the one in progress.